There’s a kind of benign magic about Avebury; it’s the sort of place where you can have fun communing with your ancestors. Like faded signposts painted in a language we do not understand, the remains they have left behind are scattered across the countryside in these parts. They point to unknown places and alien lives. Sometimes, these residues of long-gone people seem random; sometimes a tantalising pattern emerges, but then it disappears and we are left wondering whether we imagined it. 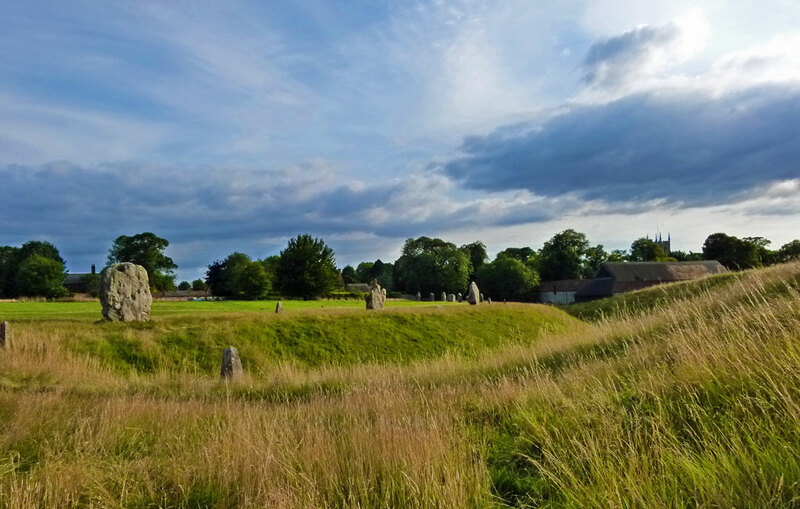 Avebury is, quite simply, astonishing, an entire village within a Neolithic stone circle. The whole area was a hub of ancient activity three and a half thousand years before Roman legions tramped along the route of the A4 between London and Bath. Evidence suggests that it was highly populated. Nearby is the mysterious Silbury Hill, the largest prehistoric mound in Europe, and West Kennet Long Barrow, the most impressive of 14 long barrows within a 3-mile radius of Avebury. Despite the wear of centuries, barrows are often easily spotted in the fields. There are glimpses of strange standing stones, simultaneously inappropriate yet curiously at home in the chalk downland. To the north lies Windmill Hill, a site dating from 3,500BC. Many call this a sacred landscape – and it is – though I suggest ’sacred’ in this context should refer to reverence for our ancestors rather than to any divine adoration, because we simply do not know all the facts. The entire Avebury complex, if it can be called that, shares World Heritage Site status with its more famous neighbour, Stonehenge, 20 miles or so to the south. Yet, while Stonehenge is truly amazing, important, and must be visited, its tourist status and presentation somehow diminishes its majesty. Nor can you any longer, as a rule, get up close and personal with the stones. Actually, even before visitors flocked to Stonehenge like camera-carrying flies to a cow-pat, 17th century diarist and antiquarian John Aubrey wrote that Avebury was a cathedral in comparison with the ‘parish church’ of Stonehenge. It is a description I can relate to and was quite put-out to discover had been used before I thought of it; Avebury is somehow very special indeed. And, at Avebury, you can get as close to the stones as you like. 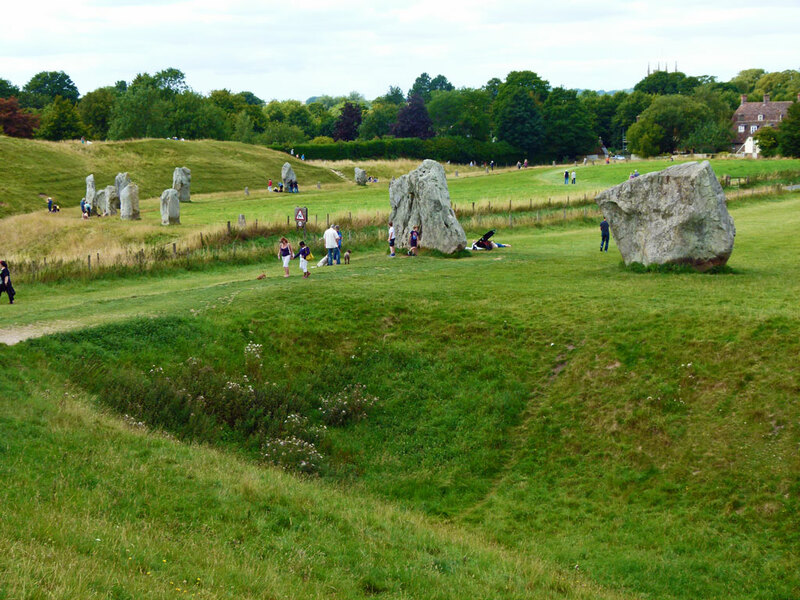 The prehistoric stone circle at Avebury is the largest in Britain: some, including the National Trust, claim it is the largest in the world; it doesn’t matter – it is big, almost a mile in circumference. A massive outer bank surrounds a ditch whose base was originally 55 feet (17 metres) below the bank top, carved and heaved out of the chalk by hand more than four and a half thousand years before you were born. The ditch was about 30 feet (9 metres) deep – it’s about half that now. Inside the ditch is a circle of stones – originally about 100 in number – of which around 30 remain. 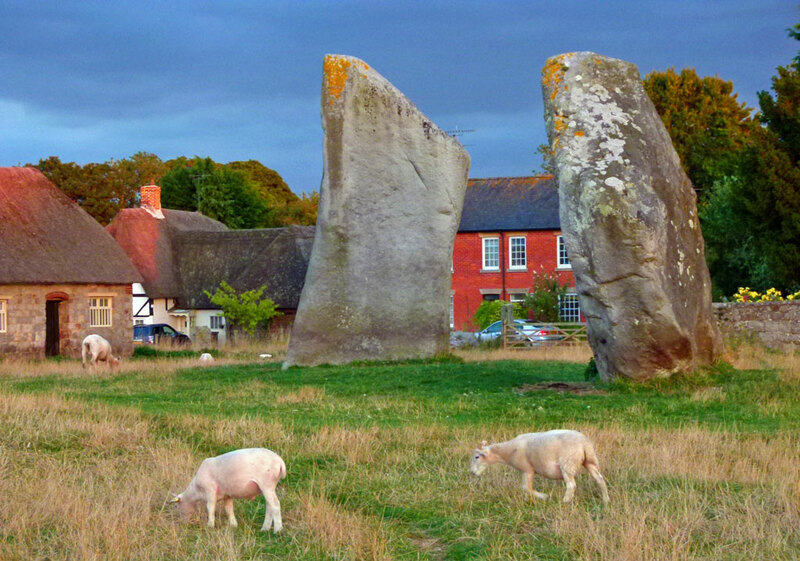 Like the upright stones at Stonehenge, local ‘sarsen’ stone was used to construct Avebury’s circle. Sarsen – the name is possibly derived from ‘Saracen’, a term once used to refer to anything or anyone foreign (or ‘pagan’) – is a sandstone, but one of the hardest rocks in the British Isles. The stones seem to come in two shapes – one long and relatively narrow and the other diamond, or lozenge, shape – and they appear to alternate: I read somewhere that this might symbolise male and female – of course it does… Unlike Stonehenge, the stones are not dressed and there are no impressive lintels which make Stonehenge iconic – the hengen, Anglo-Saxon for ‘gallows’ from which we get the word ‘henge’. Inside the outer stone circle at Avebury were two smaller stone circles, each consisting of about 30 stones with unique stone features within them. The remains of one of these smaller circles can still be seen; the other has gone, but two of the stones that once stood at its centre are still there and are known as the Cove. The outer bank has four entrances, which are used by modern roadways, and at least three of these were the original entrances to the circle. The excavation of the ditch and construction of the huge bank was carried out sometime around 2,600BC using hand tools fashioned from antlers and bone – it’s a colossal achievement. Someone estimated that it took 1.5 million man hours (possibly even longer than the British Library or Scottish Parliament, though unlike them I bet the project came in on time and under budget). Anyway, on the basis of 1.5 million man hours, assuming a team of 100 working a 7-hour, 6-day week without break, in all weathers, I estimate Avebury circle would have taken about 7 years to dig. The standing stones were added a century or two later. Heading roughly south-east and west from the circle are two stone avenues, the West Kennet and Beckhampton respectively. These are probably contemporary with the stone circles and link them with other, possibly ceremonial, sites. We can only speculate – or, if being charitable, make educated guesses – why our ancestors built Avebury and why the site was chosen. And, indeed, why it evidently fell out of use. There obviously has to be a very important reason why a society is motivated enough to undertake a project as big as this. 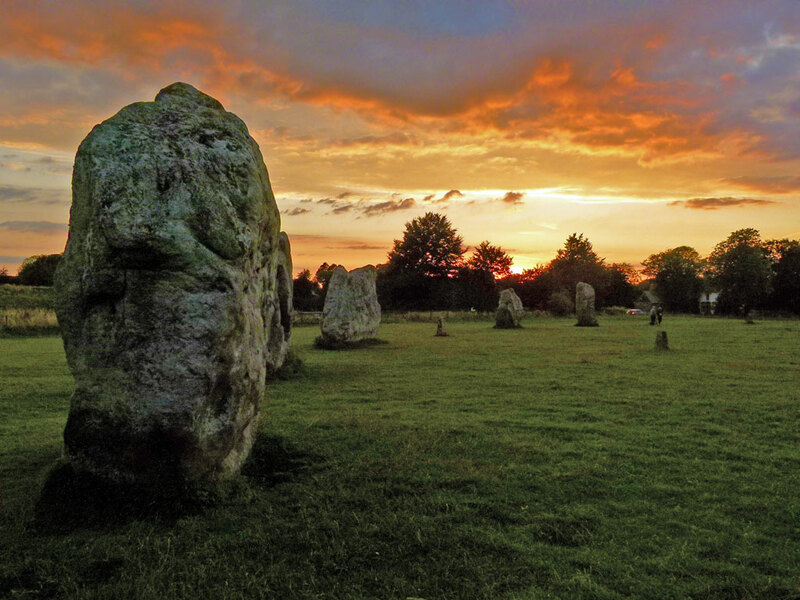 Was Avebury a religious centre, a focal point for celebrations, a meeting place – all or none of the above? And what caused people to stop using it? Invasion? Migration? Change of belief? We just do not know the answer to these questions. I’m intrigued by what later generations made of Avebury. I suspect subsequent polytheistic societies in the Iron Age, Roman and early medieval periods paid due respect to these monuments of ‘the Old People’. Apparently, there was an Anglo-Saxon settlement on what is now the car park. The name ‘Avebury’ is Saxon and suggests a fortified place or stronghold, a burgh. In the Middle Ages, possibly due to some misplaced fear, people went to the extreme trouble of pulling down some of the stones (bear in mind that each one weighs 40 tons or more) and burying them. Later, some stones were destroyed by digging a pit close by, filling the pit with combustible material, pulling the stone into the pit, firing it and then dousing the hot stone with cold water. This process made the stone crack and easier to break up. Such destructive vandalism certainly occurred in the 18th century and the pieces were almost certainly used as building-blocks in the village. 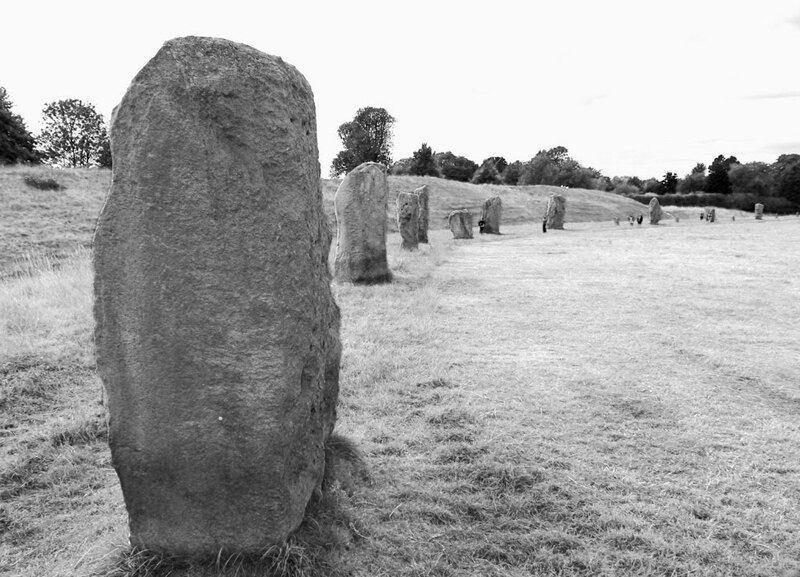 By 1908, there were only 15 upright stones on the site. We owe the preservation of Avebury to the more enlightened 20th century and, in particular, the work of Alexander Keiller from a wealthy family of marmalade makers. As I have said, there’s something about Avebury. I have visited twice now and on both occasions was reluctant to leave. 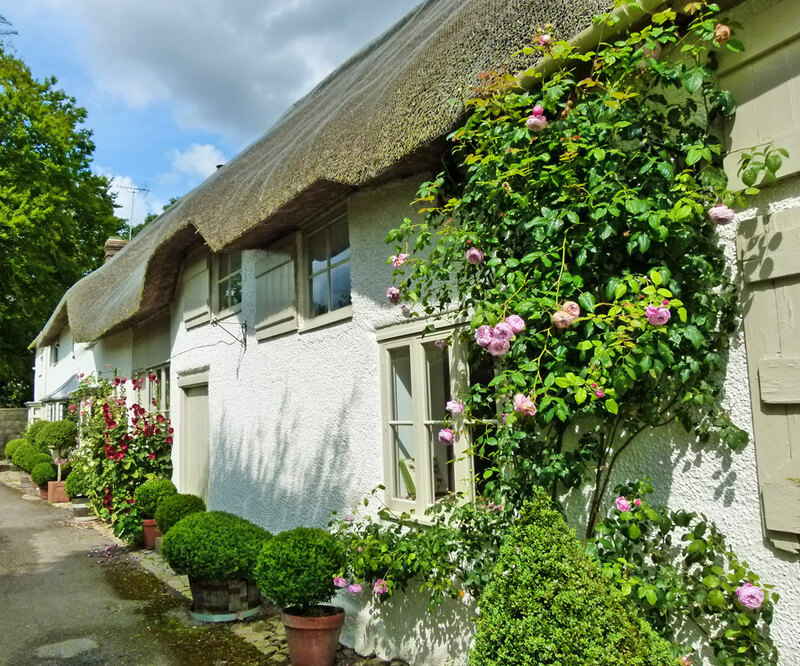 The village, carelessly dismissed by the Shell Book of English Villages as ‘scarcely memorable’ is charming and, considering the number of strange people walking about, welcoming. The church is a handsome one, largely Norman, and was offering bacon rolls, eaten perched on pews or headstones, on our last visit. There is a 16th century manor house, a couple of museums and cafes, a strong National Trust presence, and a fairly decent pub, the Red Lion, which is haunted, serves good ale and reasonable food. It’s the prehistoric remains that beckon, though. Strolling along the top of the great bank, the chalk grassland humming with colourful meadow flowers, is a very pleasant experience indeed. The stones exert their own magnetic enchantment; you simply have to touch them. Making our way from the Anglo-Saxon car-park past the village cricket pitch, where a match was in full swing, to the great chalk bank, the stones, the village, stern-looking policemen, prams, ice creams and bad shorts – the juxtaposition of ancient, modern and all points in between – was a good lesson in continuity. 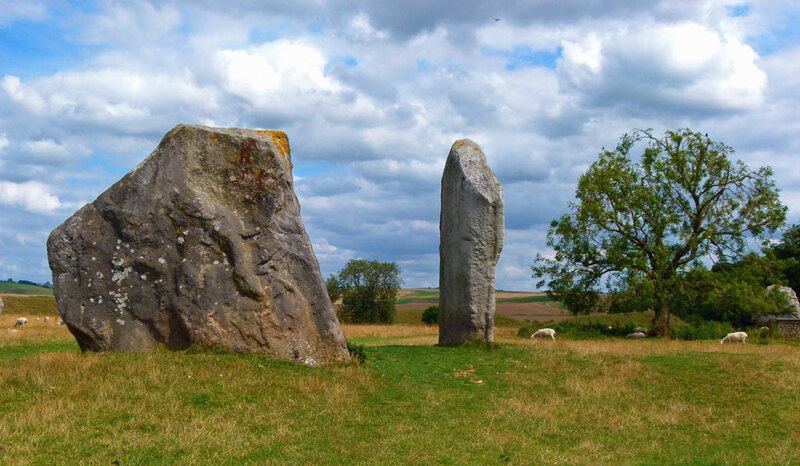 Avebury stone Circle is in the custody of English Heritage but managed by the National Trust. 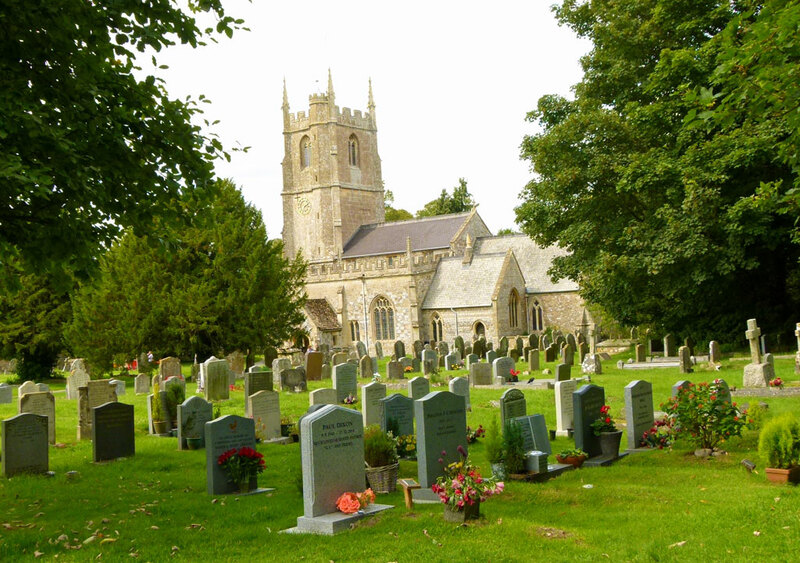 Go to A Bit About Britain’s directory listing for Avebury. Thanks for the post, Mike! Evidently I missed it earlier. I’m eager to see and touch those stones. 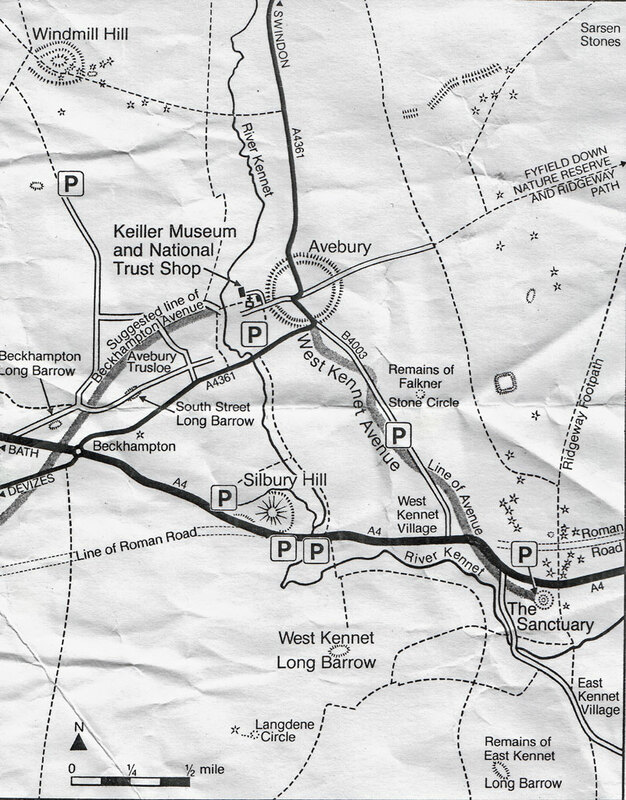 Thanks also for including the map, which I’m printing out. Hope it’s helpful, Judy. 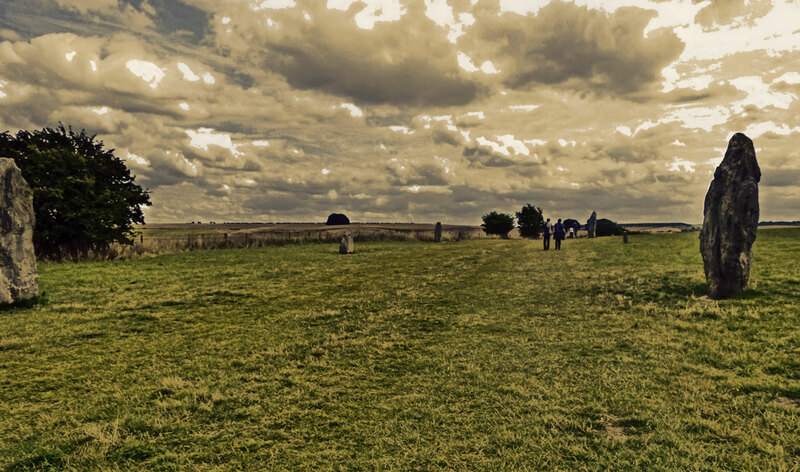 While you’re there, try not to miss other nearby site, including West Kennet Long Barrow. An extremely good post, thank you for sending me the Link. I have loved this place forever. 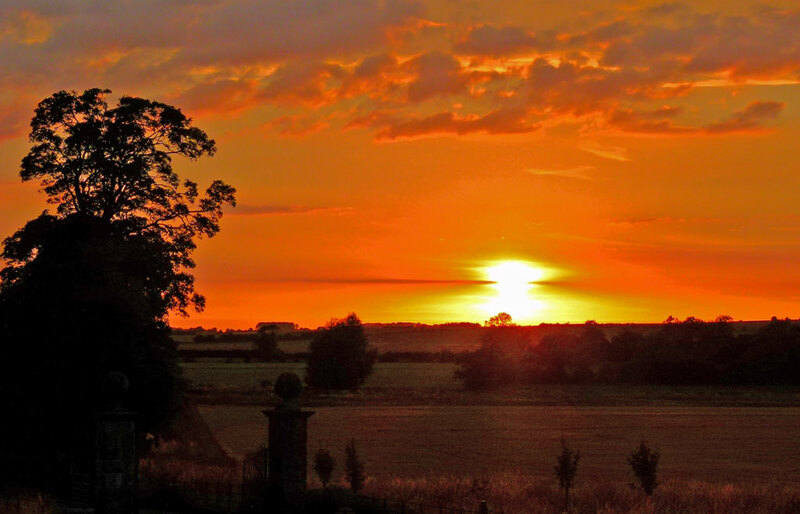 As I was born in Savernake cottage hospital and we lived in Avebury so that will not surprise you. As lifetime members of the national trust we have continued to return frequently. Now I can confidently give my husband facts of the area knowing this site is factual. As you no doubt know … there are many that profess wizardry and Alien life to be the original constructors . Thank you again I will share with pride in my place of birth. Thanks, Ellen; I think it’s a magical place, one way or another! I would say the stones are hard, most likely due to also having a component of blue metal to make the sandstone much sturdier, otherwise I think they would have ‘melted’ long before now. Would I be right in thinking all the stars in the map are locations of the stones? BTW, I think cemetery headstones are a Jewish thing that has transferred to many cultures. Interesting post, Mike. Thanks. Hi – no, the stars show the locations of tumuli (burials), or sites of them. Astonishing number of them, isn’t there? 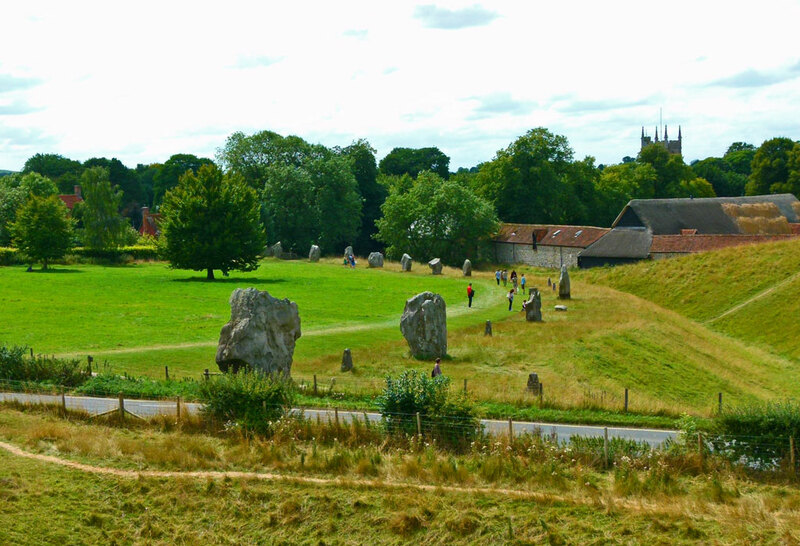 The stones are located in the circle around Avebury and along the West Kennet Avenue. I don’t know the origin of cemetery headstones, though I’m pretty sure the Romans used them sometimes. Another thing to find out…!